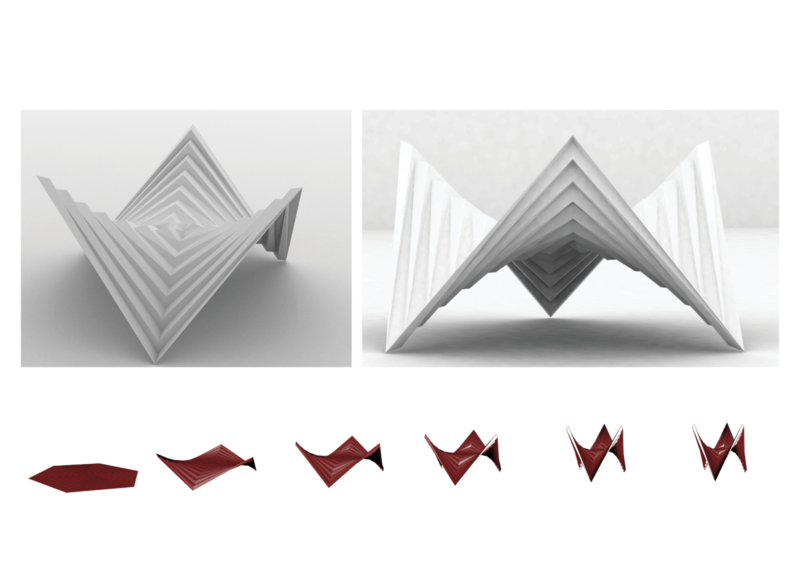 A couple of years ago I stumbled upon the term rigid origami while doing research for a university architecture project. The project was part of a course called “Optimized structures” and our task was to conceive an optimized structure. As with most crazy architecture projects we were allowed to roam free and conceive any kind of structure as long as it was some kind of optimization. My origami obsession had started quite a while before this project. There is something relaxing about folding a flat piece of paper into something entirely different, and I must admit I was also a bit intrigued by the mathematics of origami and how it all works. (About a year before this project I had a small obsession with hexaflexagons, and hexahexaflexagons.) So one day when we had been given the task to build “garbage models” (build models from watever material you can find) I folded a piece of origami which I had folded many times before, an origami tripod based on a hexagonal pattern. I found a similar shape, one made from a triangulated quadratic shape, which when folded would not have deformed faces. This one was also not (too) hard to model using trigonometric equations. So I thought, why not solve the equations of the hexagonal shape and make a parametric grasshopper script to make the shape move around a little? I managed to solve it for a simple hexagon using basic trigonometric equations, but when I got further than this I realized that the equations I was deriving simply got way to crazy for my computer and brain to fathom. I needed to figure out a simpler way to do it, or learn more complex mathematics. In the end I did what turned out to be my greatest architecture lecture learned at the university: I faked it. I made a simple model by hand in Rhino and made nice pictures for the posters. Why go through all the trouble making a dynamic model for this piece of origami? What’s so magically awesome about this shape? I wanted to see if this shape is truly a rigid origami shape – when it undergoes folding all the individual faces should not deform – this means that there should be part subjected to bending. This is what some of us crazy architect-engineers seem to spend our lives being obsessed with – pretty force patterns. If a folding structure was made so that it could be folded without it’s faces being bent it would mean that the material used could be reduced to a minimum and thus it would be a more efficient structure. Anyhow. I was completely stuck in this origami problem so I did what is always a good idea when that happens – I let my darling baby die for a little while when I went on other fun adventures. But once in a while I would still pick up my sketch book, scribble some equations, sketch the movement of the shape, or make yet another paper model. One thing I noticed when I folded the paper models was that no matter how careful I was, the triangulated faces would still be bent, because I am a human and I cannot fold every crease perfectly, I assumed. I decided I would do a good old Google search again and found out that these origami hypars are actually non-existent. Bummer? That’s when I realized I should look at the problem from the other end. What I actually wanted to do was to see if the shape could be built as a kinematic structure. And my second realization was that, I should first try to see if the goddamn shape could even move and behave almost as if it’s rigid origami. The shape is made from triangles, and because of that, the faces should not undergo any deformation if the length of the sides always remains the same while it’s being folded. In dynamic relaxation this could be expressed as “the edges of the triangles should act like extremely super stiff springs”. Tada! That I can do. I assigned a topology to the shape, and for each node I applied a load either in in the negative or positive direction according to the type of crease of the edges (valley/mountain crease in origami speak). And when I would let the relaxation routine run I would see my Coppélia dance before my eyes for the first time after a very long time of obsession. I had reached that point which Dr. Coppelius never did in the opera which had inspired the name of my project. I got to see my Coppélia come to life, and for the time being that was enough for me. I’m too busy being obsessed with other things at the moment anyway.